Envirosystems Technologies has recently introduced a new concrete surface hardener and moisture barrier, Enviro CSH. A single component, ready-to-use, spray applied surface hardener, Enviro CSH penetrates into concrete and masonry substrates to provide waterproofing protection against wear and water ingress. The water-based formulation of Enviro CSH is safe to use and easy to clean up. No priming is required prior to application of Enviro CSH. When applied to green concrete, Enviro CSH will assist with concrete curing and moisture retention. Enviro CSH conforms to AS1884-2012 as a moisture suppressant. Enviro CSH concrete surface hardener and moisture barrier has zero VOC content; stops water ingress from all directions; increases concrete longevity; hardens and densifies concrete surfaces; improves tensile and compressive strength; is compatible with most membranes and epoxies from Envirosystems; minimises freeze/thaw damage; and reduces efflorescence. 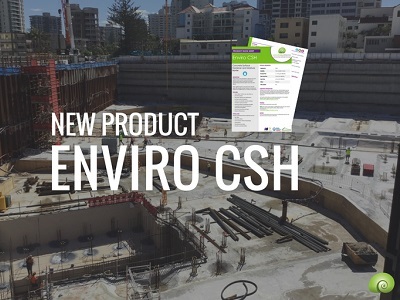 The Australian made and owned Enviro CSH is used for protecting concrete substrates such as raft slabs, warehouse floors, commercial and retail premises, garage floors, and stairwells and corridors among many more.